Living in an old 1950s grain silo probably isn’t what comes to mind when you think of home sweet home, but take a look inside this stunning renovated silo-turned-home and you may start singing to a different tune. 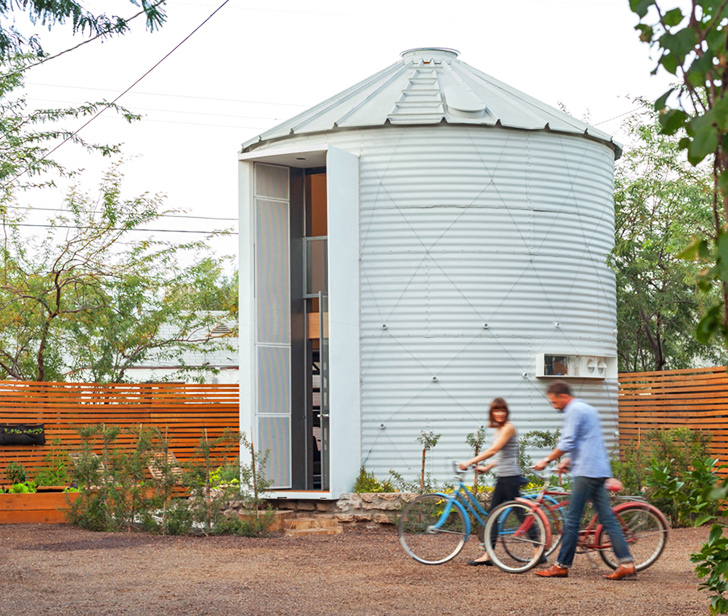 Architect Christoph Kaiser combined two of Inhabitat’s favorite topics—tiny houses and adaptive reuse—and transformed a dismantled grain silo into an affordable and cozy home built for him and his wife. 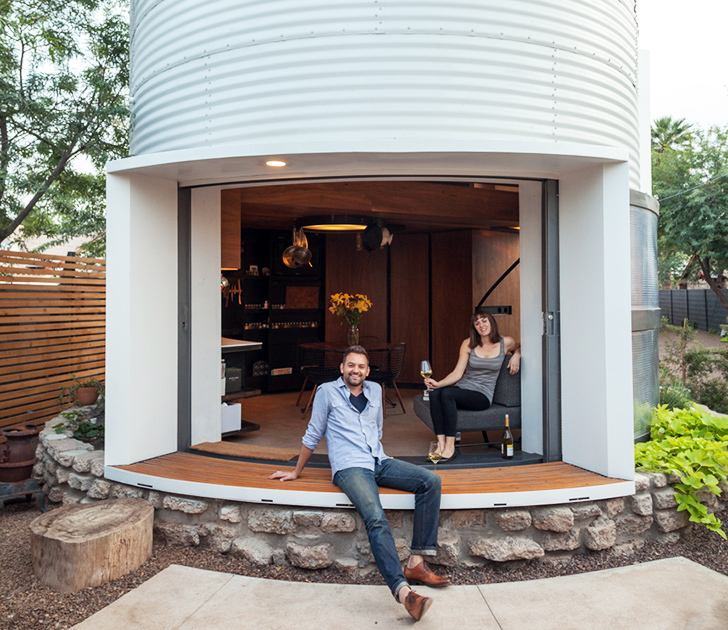 Located in downtown Phoenix, Arizona, this quirky and modern 340-square-foot dwelling boasts a small carbon footprint that has also had positive urban renewal benefits for the up-and-coming Garfield Historic District. Kaiser purchased the dismantled 1955 grain silo online from a Kansas farmer that was then transported down to Arizona on the back of a pickup truck. Major modifications were made during the reassembly process for the silo, such as the addition of custom-made doors and windows, as well as the ten inches of spray foam insulation inserted between the silo walls and house interior. The corrugated steel shell was painted white to reflect the heat of the desert sun and to evoke the character of historic American rural architecture. Rather than create a standard square living space, Kaiser challenged himself to design a curved wood-and-black-steel interior that conformed to the silo’s circular form. The young architect kept costs low by using $350 worth of scrap walnut plank flooring purchased from Craigslist as the main interior wood material and by custom designing almost all of the interior furnishings—save for a set of Eames Wire Chairs. A spiral staircase leads up to a cozy loft bedroom that’s bathed in natural light from an operable skylight located at the top of the silo. The corrugated steel shell was painted white to reflect the heat of the desert sun and to evoke the character of historic American rural architecture. 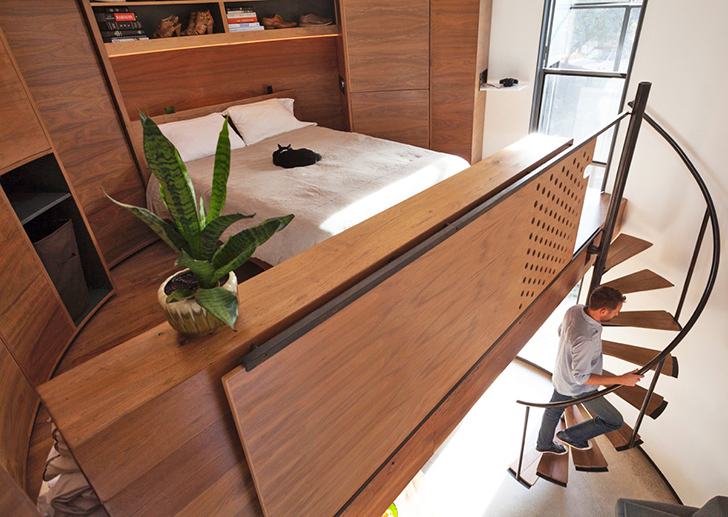 A spiral staircase leads up to a cozy loft bedroom that’s bathed in natural light from an operable skylight located at the top of the silo. Rather than create a standard square living space, Kaiser challenged himself to design a curved wood-and-black-steel interior that conformed to the silo’s circular form. Kaiser also added ten inches of spray foam insulation between the silo walls and house interior. The building has a footprint of just 190 square feet. The structure originally served as a grain silo, built in 1955 for an Arkansas farmer. Kaiser purchased the dismantled grain silo online from a Kansas farmer that was then transported down to Arizona on the back of a pickup truck. Kaiser helped keep costs low by custom designing almost all of the interior furnishings—save for a set of Eames Wire Chairs. Major modifications were made during the reassembly process for the silo, such as the addition of custom-made doors and windows. Kaiser added a custom-made, 9-foot-wide sliding door that opens up to an outdoor garden. The young architect kept costs low by using $350 worth of scrap walnut plank flooring purchased from Craigslist as the main interior wood material. The fenced-in outdoor space includes lounge chairs and raised planter beds for vegetable gardens. The house has also had positive urban renewal benefits for the up-and-coming Garfield Historic District. Kaiser lives in the house with his wife. Section view of the silo home. Plan view of the silo home.